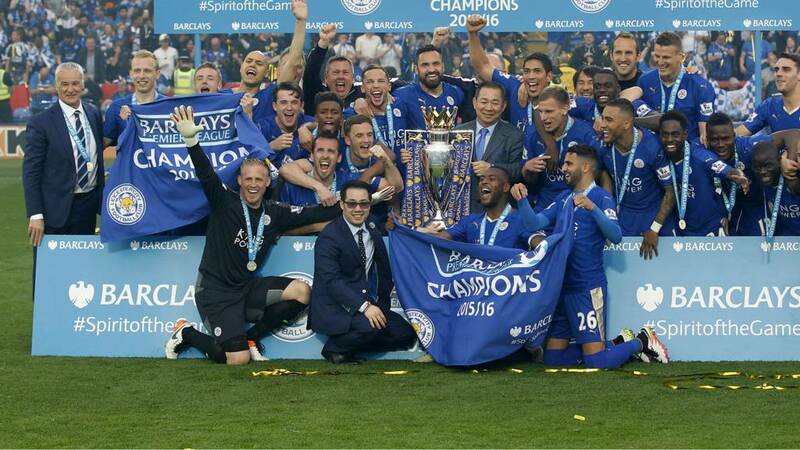 Leicester City lift the trophy and are crowned Premier League champions. Party on. Leicester winger Riyad Mahrez speaking to Sky Sports: "It is something amazing what we have done. We are enjoying with out families and it is fantastic. "The fans are unbelievable, everything is for them and the families. It is a dream and today is very special. It is amazing. "It's unbelievable. To be champions with our team I'm very happy and proud." Leicester striker Jamie Vardy, speaking to Sky Sports, calm worries over a possible hamstring injury: "It was just a bit of cramp - it completely seized up. A bit of TLC needed. "It would've been a lot better if I didn't put a ball over [from the penalty]. It is an unbelievable feeling for everyone involved. I cant describe it - it is mental. "I think someone must have put a spell on me to make it happen. Everyone works hard for each other. It if weren't for the lads then I wouldn't be on the goals that I have scored. "You don't get nowhere by not having foundations and players having the talent to get results. We are like brothers. We are always going out with each other. "After the result (Chelsea 2-2 Tottenham on Monday) you looked on streets and the police had to shut the road as there were so many people. "It's taken a lot of hard work and I'm proud of what I've achieved personally but without the lads I wouldn't be here so have to thank them." "At the beginning it was very important to stay in Premier League for a few seasons and then move up but now we are champions. "We know very well this is strange year and have to put it aside and be focussed on next season, the foundations are strong." Leicester manager Claudio Ranieri on Sky Sports: "It is fantastic the people have been unbelievable thank you to them, they push behind us all season. "I was very, very, concentrated on being calm and of course I am very very happy. I think it was an amazing moment for me I am not youngest. "To lift the trophy is something special you are champion of the Premier League that is something special for me of course because I won some cups in Spain and Italy but to be champion here is fantastic." Riyad Mahrez is going round the pitch giving high fives to all the Leicester players's children. "We are the champions, my friends,"And we'll keep on fighting 'til the end. "We are the champions. "We are the champions. "No time for losers"'Cause we are the champions of the world." Queen's 'We are the champions' belting out over the tannoy inside the King Power Stadium and players and fans are swaying from side to side. Leicester captain Wes Morgan speaking to Sky Sports: "I am emotionally drained. It was an unbelievable feeling to finally get my hands on the trophy. I had to hold back the tears, I held them back and lifted it up – it was the best feeling in the world. "Everyone has been going on about how I was going to lift the trophy and saying don't drop it and putting some pressure on me. There is no better feeling lifting the trophy. "It's like a dream but now it's a reality and you just want to enjoy it. "We have always believed. We knew on our day we were as good as all the other teams. It was about consistebncy. "We do everything together. There are no egos in our team." It has, it really has! Leicester goalkeeper Kasper Schmeichel on Sky Sports: "It was a tough game knowing we would be presented with the trophy but I thought we played fantastic, it was a testament to our character. "This is what dreams are made of, it is what you dream of as a kid. It is hard to put into words. "You can see everywhere we go we have had a fantastic response. We have received a brilliant reception everywhere and had standing ovations at numerous Premier League grounds which is amazing." There is quite a crowd scene going on out there - players, management, backroom staff, families. Wonderful stuff. Two elderly gentlemen not far from the press box have just gone into a prolonged, emotion-filled embrace. And who can blame them? This is a day they surely never thought they would see. Leicester City keeper Kasper Schmeichel is having his photograph taken by his father Peter, a title-winner himself with Manchester United, although he never pulled off a shock like this. Leicester players, staff, family and owners are now parading the trophy round the pitch. Jamie Vardy has his little girl in his hands. Peter Schmeichel is on grandfatherly duties, looking after Kasper's son Max. A future Premier League winner himself one day, perhaps? Leicester fans in floods of tears. A once in a lifetime moment. Like me and you, Leicester boss Claudio Ranieri still can't quite believe it. He holds the trophy then looks at it and almost does a double take before patting it and walking away a smile on his face. Cameron: I've got goosebumps. And I'm a Spurs fan. Unreal. Well played Leicester. Jack Blackburn: Watching Leicester lift the trophy brought a big smile to my face. Nothing is written. Miracles happen. The world is magical. On-loan full-back Ritchie De Laet was on the bench for Middlesbrough this afternoon as they won promotion from the Championship – now he’s collecting a Premier League winner’s medal with Leicester. He's a likeable chap, that Claudio Ranieri. He blows a kiss to the fans and is now calling the owners to get in on the team photo. The Leicester players are bouncing, the fans cheering and manager Claudio Ranieri is holding back the tears.